We often consider gold demand to be a measure of how many people want to store their wealth in a resource that’s more durable than the dollar. In reality, however, far more factors drive the price. In recent decades technology has become one increasingly influential driver. As gold prices increase, the technology sector becomes more aggressive in their pursuit of substitute materials, which, in turn, puts downward pressure on gold. Recently, The World Gold Council took an in-depth look at the relationship between technological development and demand for gold. In their report, they cited a dramatic rise in gold prices which quadrupled between 2005 and 2011. In response, the tech industry started to reevaluate hardware designs in an effort to stabilize their production costs. For example, electroplated coatings and gold bonding wire became thinner. At the same time, designers revisited ways to replace gold completely with alloys and substitution materials. As a result, gold, which had a 77% market share in the global bonding wire market, dropped to 40% where it stands today. The good news: this steep drop in demand from the tech sector may be leveling off, and, better still, there is reason to believe demand will increase. By the end of Q3, this year gold posted year-to-date demand growth for the first time since 2010. The drop in demand has stopped because these substitutions, namely copper, are still inferior to gold and lack the anticorrosive and malleable properties of gold. Therefore, uncompromising industries like aeronautics will likely remain loyal to gold thereby setting a “floor” to diminishing demand. The World Gold Council also cites a worldwide shortage of digital memory which should also buoy demand for gold. Just as gold demand diminishes among some technologies, it will likely grow in others. For example, new smartphone designs include new technologies like facial recognition, wireless charging, and infrared sensors. 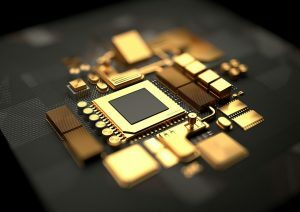 All of these features require new semiconductor designs which operate from gold bonding wire and other gold components. Battery technology is likely to become more influential to gold demand in the coming decades. As electric vehicles hit the roads, gold will become a mainstay in the manufacturing process. Moreover, other car features will require more advanced technologies and in greater numbers. In-car entertainment systems, LEDs, printed circuit boards and braking systems are all examples electronics requiring gold. The key takeaway is that a gold purchase is more than just a store of wealth. It is an investment in the industry of technology. As zero-emission cars, virtual reality and telecommunications become an increasing part of our world gold will continue to play a vital role.